Title Update 5.1 is nearly here. 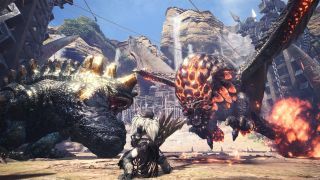 A roadmap was released for Monster Hunter: World last month, detailing a number of fixes that were expected to roll out over the next few months. One of the update listed was Title Update 5.1, and it's set to roll out tomorrow. The update will add the much-requested support for 21:9 ultrawide monitors, although sadly, it seems that cutscenes won't display 21:9. Vignette Effects will also be changed to allow three options; High/Normal/Off, rather than just On or off and a push-to-talk voice option will also be added to the game. Various bug fixes are also expected to be implemented, though these haven't been detailed at the time of writing. You can check out the updates on the Steam page here. The Monster Hunter World: Iceborne expansion was announced last month, as well as a cross-over that will see Geralt from The Witcher 3: Wild Hunt enter the game with his own, unique questline—and if that's not something to look forward to, I don't know what is!